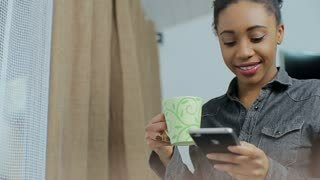 Search Results for "african american woman business"
African American woman using business app on smart phone in front of the window. Young businesswoman communicating on smartphone. African American Business Woman After Business Negotiation. Together With Colleagues They Drink Champagne. Negotiations Were Successfully Held in the Conference Room. Close Up Shoot. Young Caucasian business woman joins African American business colleague to check through a report while sitting on a sofa in a relaxed indoor setting. Slow motion mid shot recorded at 60fps. Portrait of an attractive and confident African American young business woman standing in a modern office while her team chats in the background. Slow motion.